In the world of flash games, derivatives vastly outnumber original concepts, so the charge someone copied a game is quite common. But the makers of a Pac-Man-style game in 2009 say they have an email proving that King, the outfit trademarking words like "candy" and "saga," ordered a developer to directly copy their work. Writing on a personal blog, Matthew Cox says King was once negotiating to publish Scamperghost, a game Cox and his colleague Nick Bray made in 2009. Another publisher made a better offer to license their work, however. 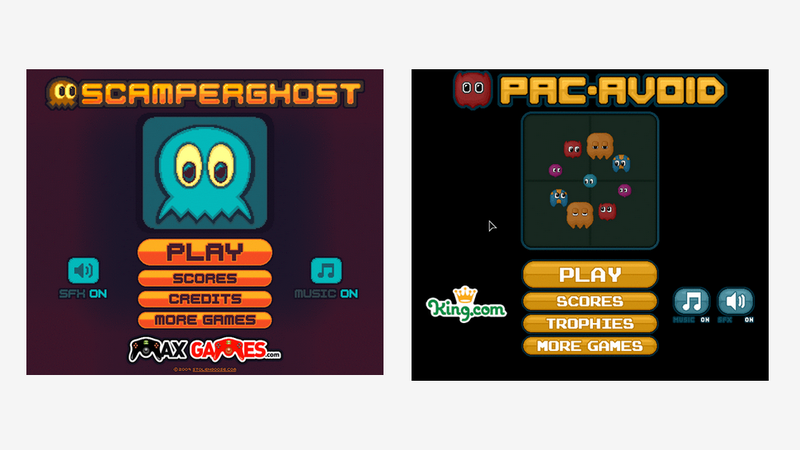 Then, they allege, King cloned Scamperghost with something called Pac-Avoid which, as Polygon reports, has since been removed from King's flash game portal, RoyalGames. "First off, sorry that we ... cloned your game for Lars of King.com," says an email from the Pac-Avoid developer, as it is quoted by Cox on his website. The developer says he was approached by a King representative and had been told that Cox had signed an agreement with King to publish Scamperghost. But as that deal had fallen apart, "He asked us to clone the game very quickly, and even wanted to beat the release of the original game." This is all relevant because King, makers of mobile megahit Candy Crush Saga, claim trademarks to the individual words "Candy" and "Saga" as they apply to video games. The claim has led them to oppose the trademark filing made by Stoic Studios for The Banner Saga, a PC role-playing game released two weeks ago. Cox, essentially, calls King hypocrites. Kotaku emailed a King representative, who said that "King does not clone other peoples' games." That said, the spokesperson acknowledged Pac-Avoid had been removed from RoyalGames.com "for the avoidance of doubt" that King had copied someone else's work. King does not clone other peoples' games. King believes that IP – both our own IP and that of others – is important and should be properly protected. Like any prudent company, we take all appropriate steps to protect our IP in a sensible and fair way. At the same time, we are respectful of the rights and IP of other developers. Before we launch any game, we do a thorough search of other games in the marketplace, as well as a review of trademark filings, to ensure that we are not infringing anyone else's IP. However, for the avoidance of doubt, in this case, this game – which was coded by a third-party developer 5 years ago – has been taken down. Cox's blog includes numerous screenshots comparing the two games and their common features. "Scamperghost isn't the most original game in the world. It's obviously inspired by Pac-Man but we at least took it in an original direction by making it a mouse avoider with no walls," he writes. "King.com, however, showed no respect for other people's intellectual property when they made a direct, blatant clone of Scamperghost."